Carbon capture is the process of removing carbon dioxide produced by hydrocarbon combustion (coal, oil and gas) before it enters the atmosphere. Control of carbon dioxide emissions is one of the most important societal and technological challenges in the foreseeable future. (i) pre-combustion capture - the hydrocarbon fuel, e.g. methane or gasified coal, is first converted to synthesis gas (CO and H2); then the CO is converted into CO2 by reacting it with water (water-gas shift reaction (CO + H2O --> CO2 + H2); CO2 is separated from the hydrogen-rich gas produced. (ii) post-combustion capture - CO2 is separated from the flue gas that is produced after hydrocarbon combustion. This separation is normally done using amine solvents. (iii) oxy-fuel combustion - air is first separated to provide the oxygen with which to carry out the combustion of coal or gas, yielding a product stream of almost pure CO2(typically 90%) and water vapour, which can be easily separated from the CO2 by condensation. The three capture methods are currently indistinguishable in terms of cost and efficiency. To improve the energy-efficiency of carbon capture technologies a combination of novel materials and solvents are needed. The gas-surface interactions and pore structure of nanoporous materials, either as adsorbents or membranes, can be optimised to favour the separation of CO2 from other components. 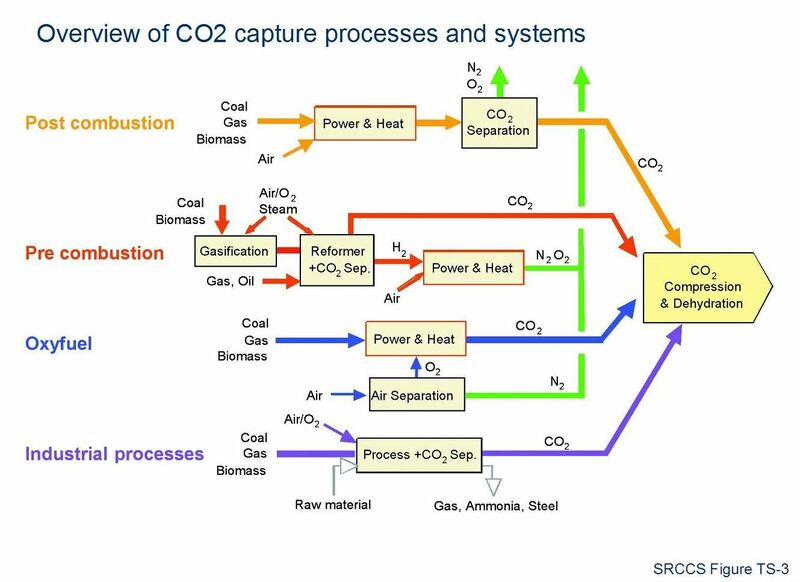 The key challenges in this area are: (i) to design materials with properties tailored to CO2 capture, (ii) to design effective and efficient capture processes using these materials, and (iii) to integrate these processes in an optimal way with power generation.